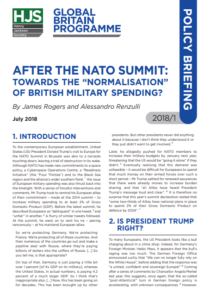 After the NATO Summit: Towards the ‘Normalisation’ of British Military Spending? argues that the time has come for European countries – including the United Kingdom – to “normalise” their defence expenditure, not least because the United States seems less will to shoulder the mainstay of the burden of the West’s defence. This policy briefing, produced in the wake of the 2018 NATO Summit, also sets out a number of options for the UK as it completes the Modernising Defence Programme. The most ambitious of these options would allow for enhancing the size of the Royal Navy, both in terms of escorts for anti-submarine and anti-air defence, as well as projection capabilities for deep-strike land attack; boosting the ability of the British Army to support NATO allies in eastern and southern Europe, especially in the Baltic and Black Sea regions; bolstering the Royal Air Force’s technological capacity and reach into space; and enabling the research into and procurement of radical new technologies to offset competitors’ advantages, including offensive and defensive cyber capability – and new weapons, such as direct energy weaponry. We have become accustomed to thinking that we should increase military spending. This is a mistake: in recently years our military budgets have fallen to their lowest ever levels if looked at from the perspective of a percentage of Gross Domestic Product. What we actually need to do is “normalise” military spending, back to the average spending over the past thirty year period. To read the full policy briefing, click here.